I finally got around to doing some power measurements on the Minix. It’s pretty good! So under an amp @12V, including the monitor. At sea I would probably keep my Iridium satphone plugged into the USB port, so that would take an extra 0.1A. The Minix is definitely slower than my bigger computers, and the fact that I’ve put my programs and chart data on the micro SD card certainly don’t help. I have to be careful when receiving wfax — if I try running other programs sometimes the fax decoding runs out of CPU cycles and the chart gets smeared. I can probably reduce the SDR sample rate and this might help. But all in all, this seems to be an adequate solution at a low price and very low power consumption. BTW, I had to install a “virtual cable” (VB-CABLE) to get the soundcard interfaces working together. WIndows 10 has made some changes in this area. I don’t know what the safe power supply voltage range is for this thing. I have another “12V” computer that runs cleanly from 10V to (at least) 15V, so I just power it from the boat battery. 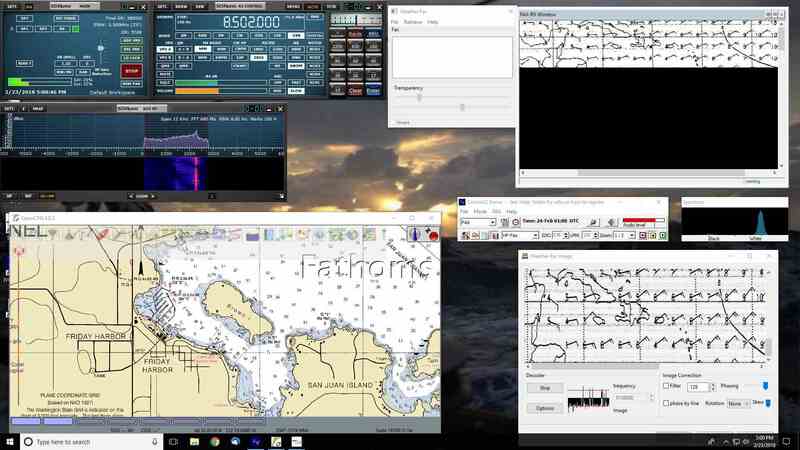 The screenshot shows the SDR program, OCPN and the wfax plugin, and JVComm (another wfax decoder), all running on the Minix.